Brushed finished 950 platinum case & bracelet with polished beveled corners. 950 platinum octagon design bezel secured by 8 polished white gold screws. Brushed finished with polished beveled corners. Set with 32 baguette cut diamonds weighing a total of +/- 3.04 carats. 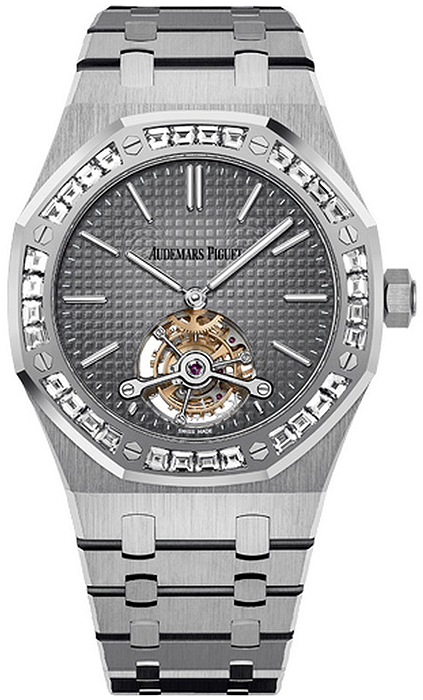 Smoked grey dial with "Petite Tapisserie" design pattern. Applied rose gold index hour markers with luminescent fill. Polished baton shaped rose gold hands with luminescent fill. Tourbillon escapement located at the 6 o'clock position. Power Reserve indicator on the movement back, visible through the sapphire crystal case back. 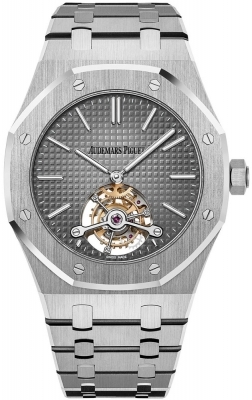 Audemars Piguet Ultra-Thin Caliber 2924, beats at 21,600 vph, composed out of 216 parts, contains 25 Jewels & has an approximate power reserve of 70 hours.